Memorial Complex "Three Bayonets": feat of the people is immortal. Each city has its landmark buildings. 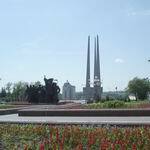 In Vitebsk it is Memorial Complex "Three Bayonets", which chronicled the immortal feat of the people. Three bayonets majestically tower above the city, reminding the citizens again and again for rough years lived and on the great sacrifice of the Soviet people in the name of Victory. In tourist Vitebsk you can walk for hours. And every time you will discover more and more pages from the history of Vitebsk, should only look around. Everyone can find something one`s own, dear, but even more mysteries and wonders are hidden here. It should once visit the portal about Vitebsk to realize that this city is not impossible to visit. Undoubtedly, there are many attractions in Vitebsk, and we can talk about them forever. But there is still a construction in the city, which is perhaps the greatest asset of the culture of Vitebsk. 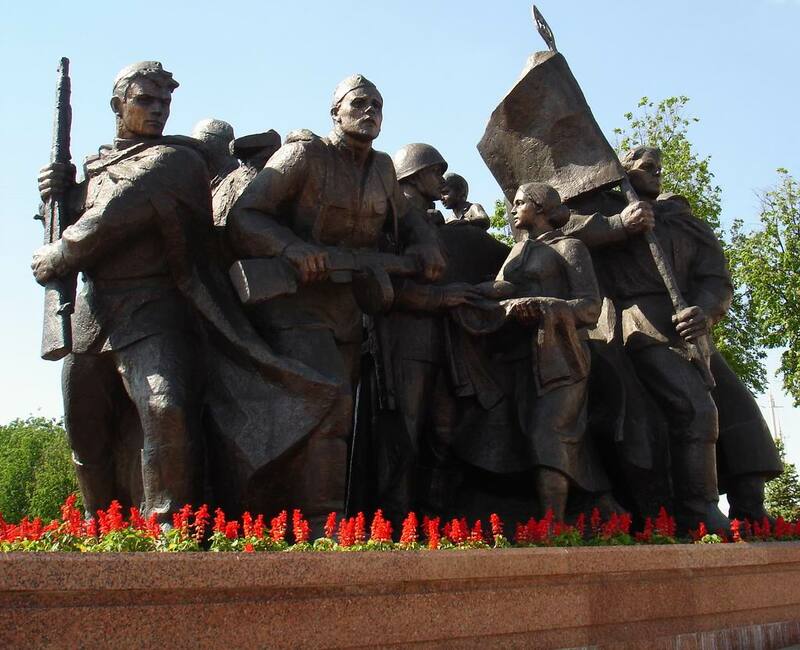 It is memorial complex "To Liberators of Vitebsk - the Soviet soldiers, partisans and underground fighters". 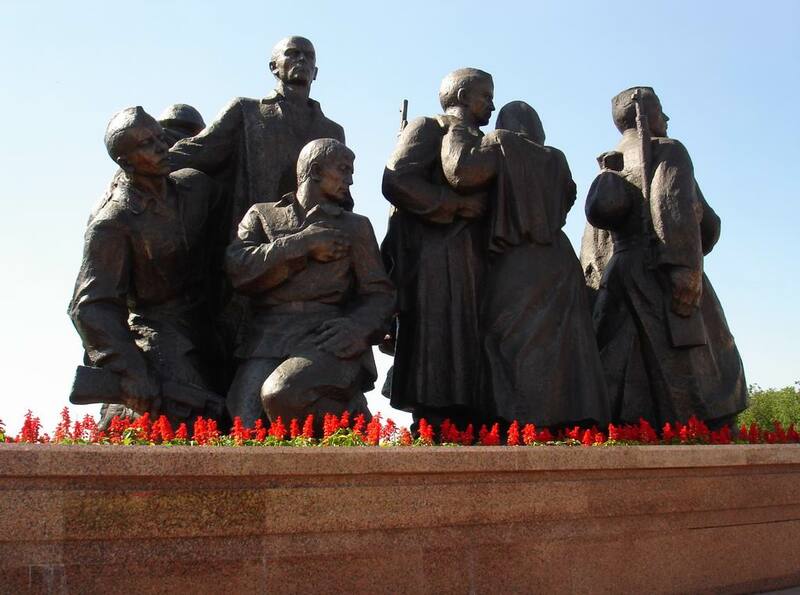 Today it is one of the greatest monuments in Vitebsk, which differs with not only monumentalism, grandeur and beauty, but also rich spiritual basis with its tragic essence laying in the bloody years of the Great Patriotic War. 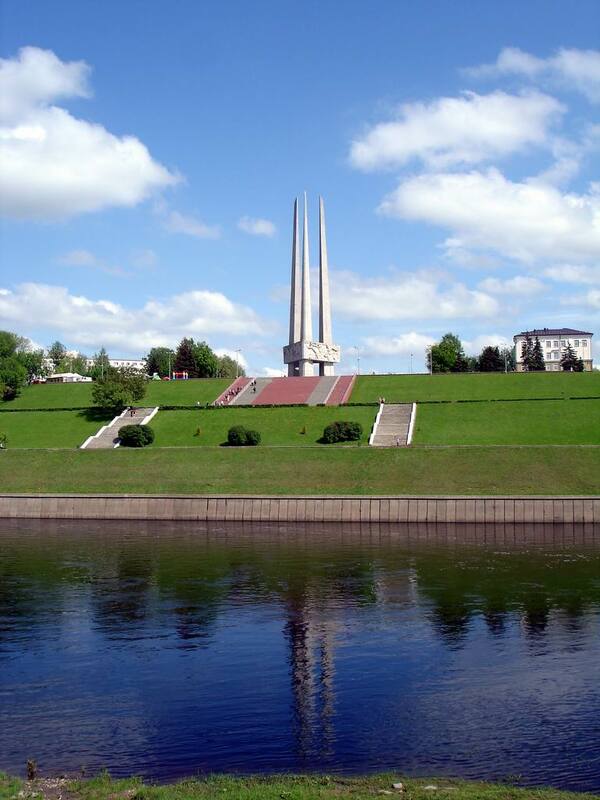 The memorial appeared in the list of the sights of Vitebsk in 1974. 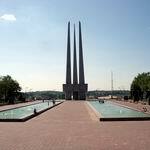 Then memorial complex "Three bayonets" by architect Y.Shpit rose in the main city Victory square. As time passed, the city developed and maturing reconstruction of the building became apparent. A large-scale restoration began in 2009 - and a year later the memorial was transformed. After the reconstruction the complex has acquired modern outlook and original design. Today, memorial "To Liberators of Vitebsk - the Soviet soldiers, partisans and underground fighters" is a huge complex where each element has its special meaning - whether it's the square, the park, the sculptures, or the pools with flowing water symbolizing dropped blood and tears ... All this serves as a prehistory to the great tragedy, an unusual frame of the central monument of the complex - memorial "Three bayonets". 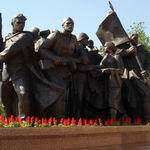 Memorial complex "Three bayonets" is located on Victory Square in Vitebsk and is its chief ornament. It is easy to see three tapering upward 56-meter trapezoidal pylons-obelisks from a distance. At the top, at about five meters heights, the obelisks are united into a single composition with the monolithic border on three sides of which the reliefs are made glorifying the immortal heroism of soldiers, partisans and underground fighters. However the pylons are united not only externally – inside there is also a ring joining three obelisks with inscription "Glory to the heroes”. And under it, on a symbolic pedestal in the form of a five-pointed star, an eternal flame is lit - as a tribute to the tragic pages in the history of Vitebsk, the courage of the citizens and the whole Soviet people. The complex is especially nice in the evening, when dusk descended on the city. In front of the night lights the memorial looks even more solemn. The original lighting of each of its elements sophisticates the complex. Not only festive meetings are held at the memorial. Memorial complex "Three bayonets" in Vitebsk is a favorite place for wedding photo shoots. 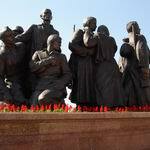 Laying flowers to the monument, the couples pay tribute to the immortal feat of the people, thus confirming the popular wisdom: preserving the memory of the past, we will multiply the future. 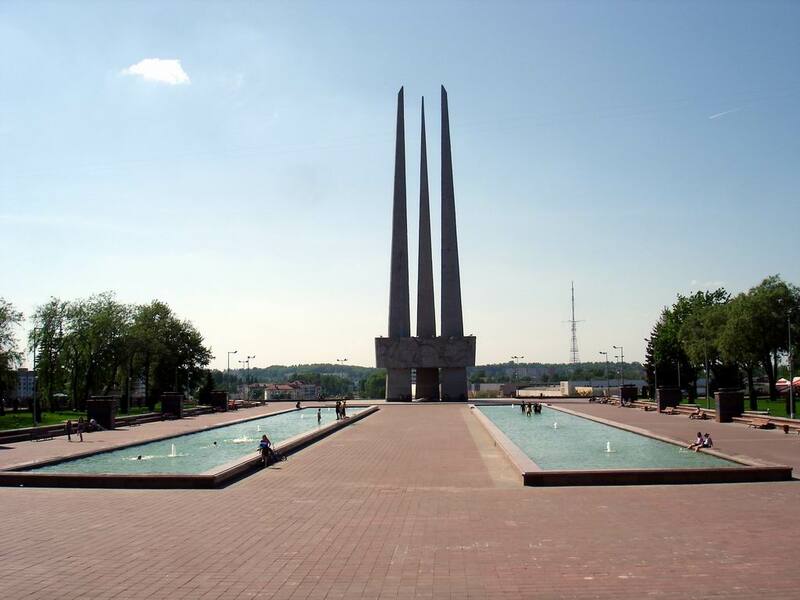 Interesting fact: Vitebsk residents gave another name to memorial complex "Three bayonets" - "triple". Where goes this name? Perhaps you should visit the complex to unravel the secrets of folk wisdom. 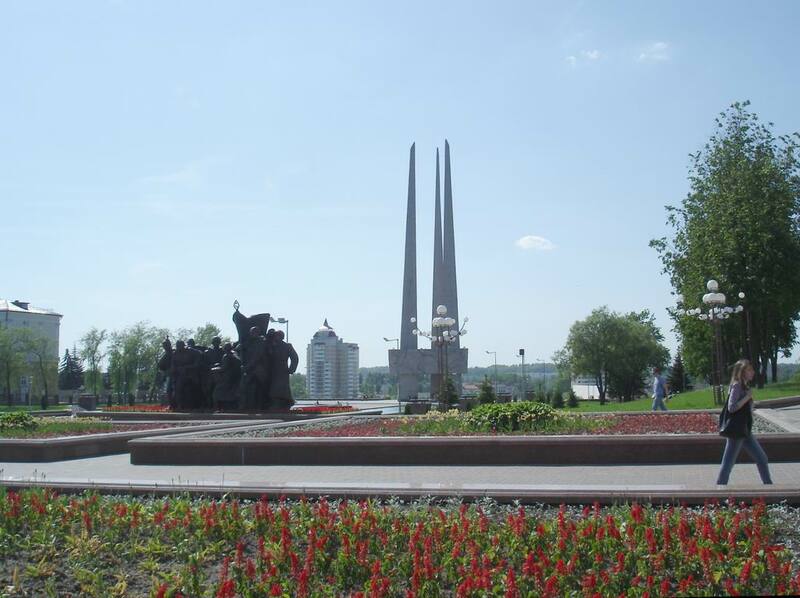 After paying tribute to heroism of the Soviet people at memorial "Three bayonets", make a leisurely stroll through Victory Square - the largest square in Belarus. Walk in Winners Park, enjoy the soothing whisper of leaves - and you will feel a surge of energy. 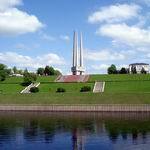 You may even want to visit other attractions in Vitebsk, which is near memorial complex "Three bayonets". Acquaintance with amazing exhibits of Exhibition Hall of Modern Art Museum and a walk on legendary Lenin Street will give unforgettable impressions. City portal VitebskCity.by will tell what role these landmarks played in the history of Vitebsk.